In 1690 Charnock founded Calcutta. Portuguese from Hugli settled here much before, as some new historical evidences suggest. It is a rare view of the Catholic Church of the Sacred Heart in Calcutta. This was originally a Roman Catholic Church for the Portuguese community in Calcutta. The Catholic Emancipation Act had been passed in 1829, and the church was built by Mrs Pascoa da Souza, a member of the prominent Portuguese family, the Barrettos, between in 1832 and 1834. It was erected behind Dharamtola Bazaar on Dhurrumtollah (Dharamtola) Street at the centre of British Calcutta. 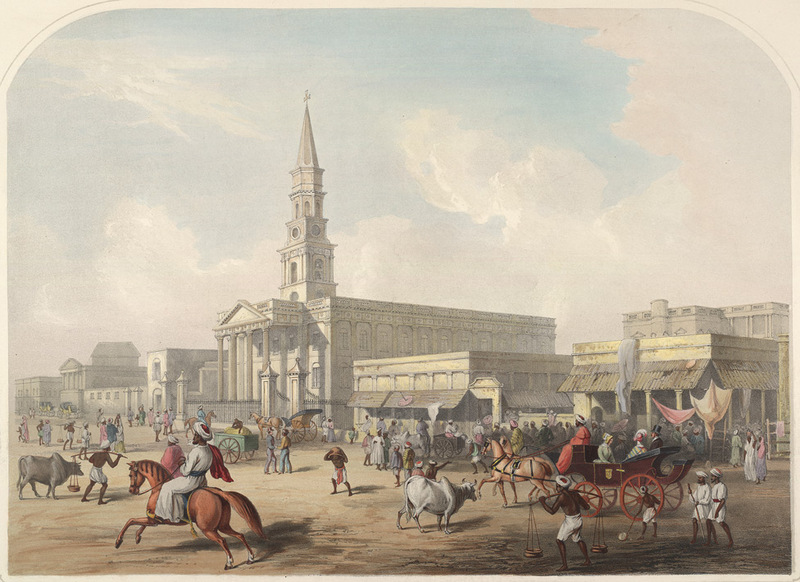 This coloured lithograph, dated 1848, is taken from plate 7 of Sir Charles D’Oyly’s ‘ Views of Calcutta and its environs’. This entry was posted in Customs/ Rites, Establishments, Ways of Life and tagged Barrettos, Bow Bazar, catholic church, Church of the Sacred Heart, Churches, Dharamtola, Dharamtola Bazaar, Dhurrumtollah, gracia elizabeth, Lady of Doris, old calcutta, Pascoa da Souza, portuguese, portuguese chapel. One of my family were married there Edward rodulphus arathoon in 1914 22nd March to Ethel maud Carrison .i am just trying to trace back as I am very interested. I took quite a long time only to find my helplessness in getting something of your interest. It is probably Sacred Heart Church situated in present day Lenin Sarani. I am telling you this from my experience but you can go though historical evidence. It will be better if you can mention the name of the Church in the details. That will help others. Thanks for your comments. Yes, the Church standing on Lenin Sarani is the famous ‘Sacred Heart Church’ – a Roman Catholic Church of the Sacred Heart of Jesus built nearly one hundred seventy years ago by the Portuguese community. I will try to gather more in course of time.